While this family is on the go all the time, they gather every evening for dinner, something very important to Meredith. “We make it a point to have a sit-down dinner together almost every night during the week, even if it’s almost bedtime. Most days this is the only time we’re all together and can talk about any upcoming events or things that may be going on at school or in our personal lives,” she says. 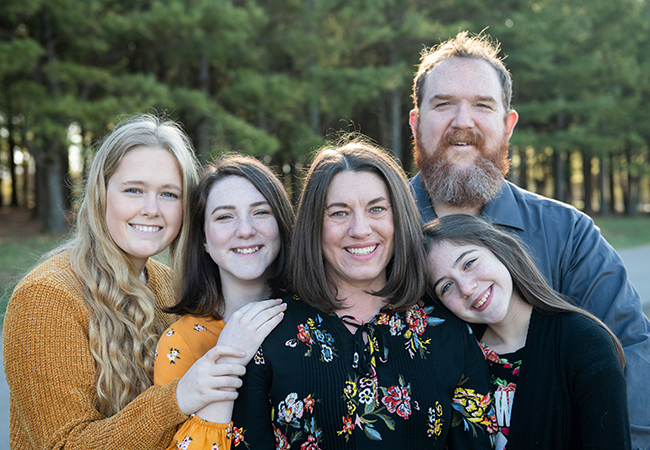 Though she would never describe herself as a Super Mom, Meredith’s actions and service to others, particularly her family, and her extended family of Girl Scouts, Exchange Students, and the children of Madison County, automatically elect her to Super Hero Status. Inspired by her own mother daily to be the best mom she can be, Meredith divulges, “I just want the best for my kids. I want them to have the chance to do things and I want them to believe in themselves. I want them to look back and remember that I tried to give them the best of myself while encouraging them to play sports, be brave, and get out and try new things.” Here, Meredith was gracious enough to provide some insight into her family activities, the tools that keep them organized and the sources she draws from to keep her superwoman-like-powers flowing. TOPS: What is the most rewarding part of being a mom? ML: The most rewarding part for me is just simply watching my girls grow up. I love to watch them when they’re with their friends and watch how they interact. I love when I catch them being nice to each other and acting like friends instead of big sister/little sister. My favorite part is just watching them grow into more loving, caring, thoughtful, and kind young ladies who are trying to do good things in life. TOPS: How do you manage to balance your time with work, social, health and family obligations? ML: Lists and calendars! I keep lists and put everything in my Google calendar that Darius (my husband) and I share. Darius and I work together on every aspect. We’re on the same team and I couldn’t do anything as a mom without him! Another big thing we do is meal planning. We don’t meal PREP – we just plan. Typically, we plan our meals out for the month based on our scheduled activities using an app that also keeps a running grocery list for us. Then we use Click List at Kroger – it’s seriously the best invention! TOPS: Is there anything else you’d like to add about why you are a super mom? ML: I know I mentioned my husband before, but I honestly couldn’t do this without him. He works full time and drives almost four hours a day and is still as involved with our family and activities as he possibly can be and always has been. He has always supported me in all I’ve wanted to do and everything I’ve signed up for, even when it took time away from him. TOPS: What advice do you have for other moms? ML: Take care of yourself both physically and emotionally. Do something that makes you happy: go the gym, have lunch with a friend, go on a trip, or just meet for coffee. Stay in touch with the people you care about and don’t compare yourself or your kids to other moms and their kids. Spend time alone with your husband, even if you can only find a few minutes a day or at the grocery together. Finally, make sure you have a good support system and great friends. We all need someone to laugh with, share the good and bad with, go on adventures with, and sometimes, even share the responsibility of driving each other’s kids around or keeping them for a few days. It really does take a village!